Vintage Tureen Lidded Tureen - White And Gold. White with gold flowers & leaves. Transfer prints and hand painted details. In a very good condition. They are unmarked, apart from one cup has England stamped on base, I would guess they are from one of the Staffordshire factories c1930's. Made in England. This is a very pretty set in very good condition. Butterfly and floral design in colours of yellows and green so typical of the era. All plates have slightly scalloped edges. 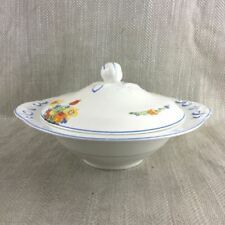 Royal Doulton Josephine (original design not later reproduction)8" Wide 4" high Vegetable Tureen with Lid. Empire 8.5" Tureen Serving Dish with Lid. 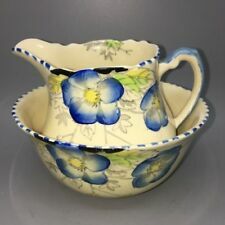 Empire7" Gravy Boat 3" Deep. New Hall Hanley Staffordshire Soup Bowls And Saucers x 6. 1930's. This decorative item has always been out on display. It is Art Pottery and as such would not be suitable for food use. Hand painted and very beautiful. 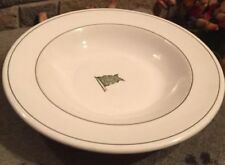 MASON'S 'MANDALAY' ART DECO DINNER PLATE. Exquisite floral design. Wonderful hand coloured midwinter bowl. Circa 1930s. This is a stunning example, the colours are strong and vibrant throughout. A Wild West Wagon or Caravan. to include teapot with lid, sucrier (lacking lid) and milk jug. Milk Jug 3 1/2" tall x 5" overall width. A Novelty three piece Tea Set. each piece modelled in the form of. 2 x lovely Cauldon Pottery dishes or saucers in the chariot pattern, great classical landscapes. Good chariot marks on base and an impressed mark too. Seen these dated 1910 and 1930s. Condition - excellent - No cracks, chips or issues. See all photos to help assess condition fully size - approx 17.2 cm or 6 3/4” across, 2.4 cm or 1” tall Postage and packing I pack parcels very well using recycled materials where possible, both to keep costs down and be more sustainable. I welcome bids from international bidders but please ask for postage costs before bidding. Costs quoted for Europe. Colourful floral motifs on white background. 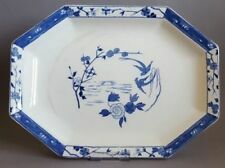 Large oval plate or platter by B & L B (Leighton Pottery) Astoria design. 30.5 cm long 25 cm wide 3 cm deep. Hand finished decorative edge band in brown rust green black and gilt. Back stamp dates plate from 1930. Staffordshire, manufactured in the 1920s and early 1930s. New Hall Hanley Staffordshire 2 handled Soup Bowl & Saucer 1930's. This cup and saucer set was handed down from my late parents who inherited it from my Grand parents. Bourne & Leigh Leighton Pottery. The Set is in okay condition no restorations. (As per pictures). Decorated with chintz 'June ware' pattern. A Striking Royal Staffordshire Wilkinson Teapot. Art Deco Era 1930's. make Supersized seem small. Get images that. bares factory marks to under side. otherwise condition is fine. The plates/dishes are approx 9"(22.5cm) wide and 1.5" (4cm) deep. All are decorated in the Savoy pattern. 1 is date stamped 1936 and all 4 are from the 1930s. 4 soup bowls/plates in brown, orange and cream, distributed by H.H.&G. Ltd.
'Wacol'design. Cream jug with gold painted rim. GOOD CONDITION. Weight 471 gm. There is ELEVEN (11) pieces (including lid) in this sale Pattern Name: Ye Olde English (Golden Yellow) Pattern Reg No: 627816 In production from 1923 to 1930 Smooth decorated in florals and birds on golden yellow rim with gold trim Most in excellent used age old condition. There is a chip to one saucer, repair to coffee pot lid, hairline to sugar bowl and one cup handle as shown in last four (4) photos below this listing with pencil Items included in this sale are 4 x Coffee Cans/Cups (5.5cm high x 5.25cm wide on rim) 4 x Coffee Cup Saucers (11cm wide) 1 x Open Sugar Bowl (5.5cm high x 8.75cm wide on rim) 1 x Footed Coffee Pot & Cover (20cm high to finial x 10cm wide x 19cm from handle to spout) All with makers marks and 1st quality. BARKER BROS LTD. Colour - White Background Single Pink Rose and Gold flower edge. Underneath says in black. Art Deco Hand Painted Cheese Dish. Good condition, no cracks or repairs. Sandwich / Cake Plate approx. 12" x 6 1/4". Side Plates 5 3/4" x 5 3/4". 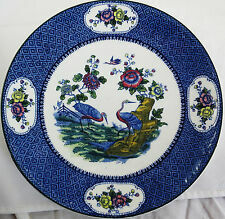 New listingMason's ironstone china plates x 5 hand painted. Country scene & cows. Mason's ironstone china plates. Country scene & cows. Art Deco Ko-Shan Pattern Platter. Weight 1770 grams. This item is available for sale elsewhere so may be removed without notice. L:400mm tall x W:300mm. New Hanley Staffordshire Romney Pink Tulip Gravy Boat 1930's. 4.5" x 7.5" approx. In great condition for it's age, no chips, cracks, breaks or crazing. Part of a stunning 75 piece set I am listing which has obviously been really well looked after over the years. Will be carefully wrapped for posting. Would love for the whole set to go as one..looks amazing together. Dispatched with Royal Mail 2nd Class, signed for. Many thanks for looking. Pretty ivory ware plate, previously owned but in generally good condition. Hand painted flower and leaf pattern, and yellow ochre finish to the rim. 130mm across top including handle. New Hall Hanley Romney Pink Tulip Lidded Tureen 1930's. New Hall Hanley Romney Pink Tulip Lidded Tureen 1930's.. Measuring approximately 10" x 5". Doesn't appear to have been used but does have three small chips on the underside of the lid. Other items are being listed from an almost complete 75 piece, ' 6 piece set'. Some items appear to have been used very lightly but the majority haven't and have obviously been very well cared for over the years. The whole set together looks stunning and would love for it all to go as a complete set. Postage will be 2nd Class, signed for, Royal Mail. Will be extremely well wrapped for posting. Many thanks for looking. Dispatched with Royal Mail 2nd Class. One of two listed. Mason's ironstone china plates x 5 hand painted. Country scene & cows. Hughes Pottery 6 x Side Plates. C. 1935-57.